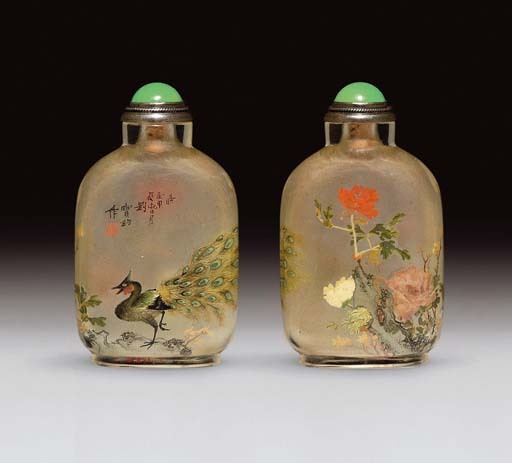 This is the second of the three Liu Baojun inside-painted bottles in the Meriem Collection, and one of only seven known. Liu seemed to favor painting birds, and another inside-painted snuff bottle by this artist with similar subject is illustrated by Moss, Graham, Tsang, The Art of the Chinese Snuff Bottle. The J & J Collection, p. 728, no. 446. The "boneless" technique employed is similar to that of another Beijing artist from the turn of the century, Ziyizi. It was probably inspired by the early-Qing artist, Yun Shouping, as an alternative to the linear style which so dominated literati painting at the time. The peacock is the badge of rank for the third level of the nine grades of the civil service. The bird is often depicted standing on a rock with one foot raised as it looks over one shoulder toward the sun.